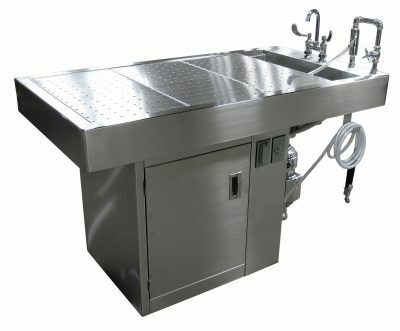 Our Downdraft Tables are designed to provide a ventilated workstation for animal necropsies, surgeries, perfusions, and dissections. Tables pull air, odors, vapors, and aerosols down and away from the face of personnel when connected to a negative air source. Chemicals such as formalin, alcohol, and xylene are controlled and can be kept below OSHA-permissible exposure limits, providing a health-safe work environment. Our is committed to the design and production of laboratory equipment that is highly functional, versatile, durable, and easy to clean and maintain. These specialty downdraft tables and stations are excellent examples of our unwavering commitment to provide equipment that meets the exact needs of the researcher.